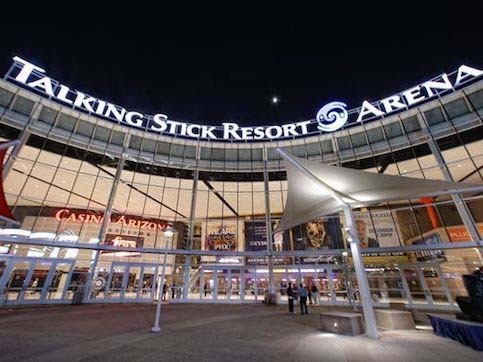 Two leading candidates for mayor in Phoenix, Arizona are opposed to a potential $450 million deal that would overhaul Talking Stick Resort Arena. The arena is home to the Phoenix Suns, the Phoenix Mercury, and the Arizona Rattlers. Kate Gallego is a councilwoman and mayoral candidate in the city. Despite acknowledging the strong relationship between the Suns and the city of Phoenix, Gallego expressed that there are other priorities that are more pressing within the city. Councilman Daniel Valenzuela has also agreed with Gallego’s sentiment. There are estimates that taxpayers would contribute $225 million to the project with the Suns putting at least $125 million toward the renovations. City council members continue to debate the topic as Phoenix residents appear hesitant to subsidize the overhaul. Phoenix Suns’ owner, Robert Sarver, has said that he prefers a renovation over building a new stadium. For now, it appears that if any renovations do occur, the team would need to contribute a significant amount in funding. As negotiations continue, actual costs of the overhaul are not yet readily available for the public. The majority of the council’s meetings will proceed behind closed doors in the coming weeks. Talking Stick Resort Arena has been home to the Phoenix Suns since its opening in 1992. Current plans for any type of renovations do not appear to include a hockey rink for the Arizona Coyotes. The National Hockey League team plays in Glendale, Arizona at the Gila River Arena. The Phoenix Suns do have the option to get out of their contract with Talking Stick Resort Arena in 2022. A resolution for the type of overhaul necessary could improve the basketball team’s chances of remaining at their location in downtown Phoenix. Sarver has noted that being downtown is advantageous to the team and their fan base. Meeting for the last several weeks, the Phoenix City Council has a big decision on their hands. While building a new arena would require a citywide vote, only the city council is needed to approve renovations. As taxpayers are likely not expected to support the overhaul, the recent opposition expressed by council members indicates that current plans for renovations may not be approved. At nearly half a billions dollars, the plans for the arena would include complete overhauls of the stadium interior. Brand new NBA arenas, on the other hand, have come in at above the $500 million price tag. The Phoenix City Council is also expecting to see several changes in the coming year. At least three members intend to resign in order to run for higher office. A vote on the arena plans could, however, be concluded before the end of the year. With the potential changes to the council coming in 2018, the city would serve itself to resolve the matter before year’s end. Residents await the outcome of these recent discussions. At 25-years-old, Talking Stick Resort Arena could see renovations in the coming years if this set of discussions remains open-ended.